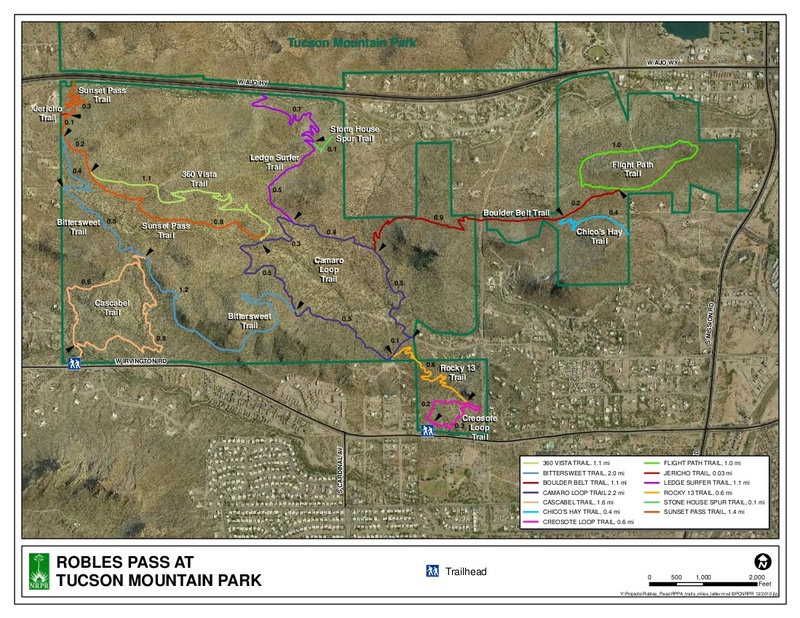 The Bowen Trail is a new addition to the Tucson Mountain Park and is only 0.8 miles long. A nice hike is to the Old Stone House. The house was built in the 1930's by Sherry Bowen, a typesetter and, later city editor for the Arizona Daily Star. Bowen brought his wife, Ruby, to Tucson from Rockford, Illinois, in the late twenties, hoping that the climate would help her serious heart condition. They homesteaded in the Tucson Mountains eventually owning two thousand acres. Ruby kept a diary of her first year in the Tucson Mountains. She wrote of the wild mountain sheep that came to the base of the cliffs nearly every evening to graze. A mountain lion would pace about when she was cooking meat and one time attempted to get in the window. The valley and their homestead became part of the Tucson Mountain Park in 1983. A nice loop hike of 4.6 miles can be made by following the Bowen Trail to the Old Stone House and then following the Yetman Trail another 1.0 miles south to a trail junction. You can then take the old 4WD road past the water tank back to the hotel parking lot or pick up the Rock Wren Trail as it loops around the south side of the water tank to the Star Pass Trailhead at the south end of Clearwater Drive. It's only a 1/2 mile hike on the road back to the hotel parking lot. The so called Bowen trail was created in 1991, so it's not exactly new. I have no idea when it was *accepted* into the official trails list which means nothing to me, but I made it in 1991. Since I did it without any permission, I wasn't exactly keen on bragging about it at the time. I figure 20 years is long enough for the statute of limitations to keep me out of trouble now. 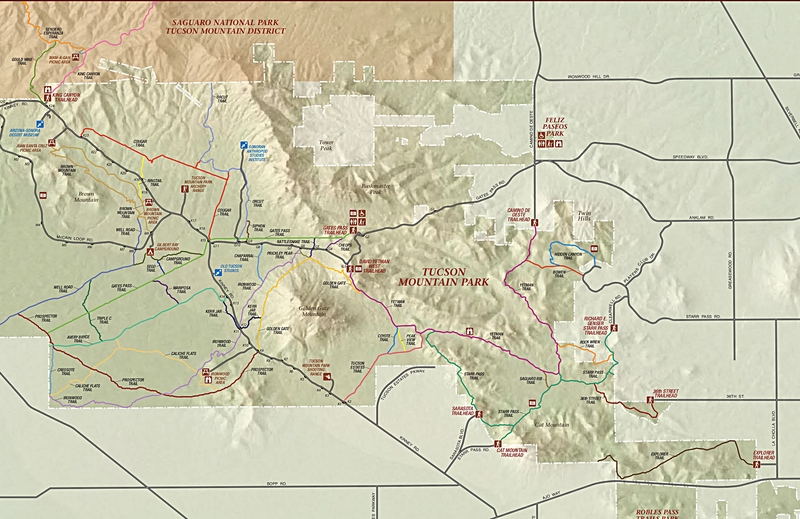 Pima County-managed trailheads open at dawn and close at dusk, except as otherwise noted (link below). Be aware that trailhead hours may vary according to location and managing agency. The following trailheads allow after hours parking with a permit: Avenida de Suzenu, Bear Canyon, Campbell, El Camino del Cerro, Pima Canyon, Finger Rock, and Ventana Canyon. No after hours parking is allowed at the other Pima County trailheads. Trailhead parking permits are available at no cost. 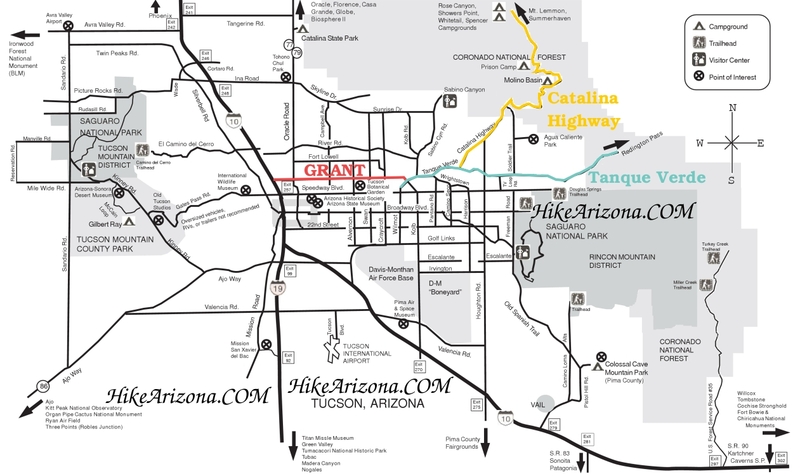 Permits are required for Cienega Creek Natural Preserve, Empirita Ranch Access, and overnight parking at Pima County trailheads. Please call 520-877-6158 to request a permit or come in to the Natural Resources, Parks and Recreation Administration Building at 3500 West River Road Monday – Friday, 8:00 a.m. – 4:30 p.m. Permits are not issued on Saturdays, Sundays, or county holidays. Vist pima.gov for more information. From downtown Tucson go south to 22nd Street and head west. Follow 22nd Street until it turns into Star Pass Blvd. Continue to the JW Marriot entrance and then turn right on the service road. Follow the service road to just past the laoding dock and park on the right side of the road. Walk up the road and past the hotel entrance. The trailhead is about 150 yards past the main hotel entrance.